In the year 2000, world leaders adopted the Millennium Declaration. A commitment to a peaceful, prosperous, and just world, the declaration included a set of targets for development and poverty reduction to be reached by 2015. These came to be known as the Millennium Development Goals (MDGs). As the 2015 end date approaches, the world asks what will replace the MDGs? The post-2015 framework presents a major opportunity to catalyze real action on priorities that are critical for eradicating extreme poverty and supporting sustainable growth and prosperity. 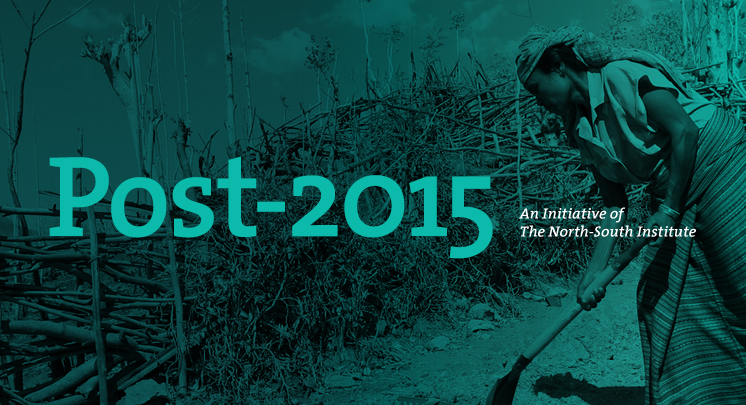 As the world continues to monitor the post-2015 development agenda, so will NSI. NSI is actively engaging on the Post-2015 Development Agenda. Alongside our projects, publications and commentary, NSI’s Post-2015 Tracking Tool, an interactive aggregator of proposals on the post-2015 development agenda, is a unique resource for tracking the goals, targets and indicators that are being proposed to replace the MDGs and support and monitor development progress beyond 2015. Report: Measuring Progress Post-2015: An Assessment of Proposals, by Kate Higgins, Rebekka Bond and Shannon Kindornay (NSI), February 2014. New Project: Post-2015 Data Test: Unpacking the Data Revolution at the Country Level, led by The North-South Institute and Centre for Policy Dialogue, in association with the Southern Voice on Post-MDG International Development Goals. Policy Brief: The Power of Global Goals: Reflections on the MDGs, by Kate Higgins (NSI), September 2013. Policy Brief: Post-2015 Agenda: New Priorities for a Changing Global Context, by Kate Higgins (NSI), September 2013. Policy Brief: Establishing the Post-2015 Agenda: Process and Architecture, by Kate Higgins (NSI), September 2013. Roundtable Report: The Post-2015 Development Agenda: Reflections from the High-Level Panel Secretariat, by Rebekka Bond and Kate Higgins (NSI), July 2013. Report: Reflecting on the MDGs and Making Sense of the Post-2015 Development Agenda, by Kate Higgins (NSI), June 2013. Report: Financing the Post-2015 Development Agenda: Domestic Revenue Mobilization in Africa, by Aniket Bhushan (NSI), Yiagadeesen Samy and Kemi Medu, September 2013. Policy Brief: Domestic Resource Mobilization and the Post-2015 Agenda, by Aniket Bhushan (NSI), April 2013. Op-Ed: The Achilles Heel of the Post-2015 Agenda, by Shannon Kindornay (NSI), published in Devex, November 2013. Op-Ed: Post-2015 as the Litmus Test for Global Governance, by Shannon Kindornay (NSI), published by The Ottawa Citizen, October 2013. Article: Post-2015 Development Goals Could Apply to Canada, by Kristen Shane, published by Embassy News, September 2013. Op-Ed: Monitoring New Development Goals Abroad, and at Home, by Kate Higgins (NSI), published by The Ottawa Citizen, June 2013. Op-Ed: MDGs and Fragile States: A Red Herring?, by Jennifer Erin Salahub (NSI), published by The Ottawa Citizen, May 2013. Op-Ed: A Sustainable Forum, by Kate Higgins (NSI), published by Open Canada, April 2013. Op-Ed: Getting Behind Global Development Goals, by Kate Higgins (NSI), published by The Ottawa Citizen, March 2013. Op-Ed: One Size Only, One Global Customer? Why Universality and Tiering Should Be Part of the Post-2015 MDG Conversation, by John Sinclair (NSI Distinguished Research Associate), published by Open Canada, February 2013. Op-Ed: On the Road to Replacing the MDGs, by Kate Higgins (NSI), published by Open Canada, February 2013.